This has been expanded to include four cylinder tractors thru the early thousand series that ended in 1964. My Ford 3000 was the 3-cylinder version built after 1965. Anything built after 1964 is not included here. Refer to tractordata.com to find photos and information about other years, makes, and models of farm tractors. 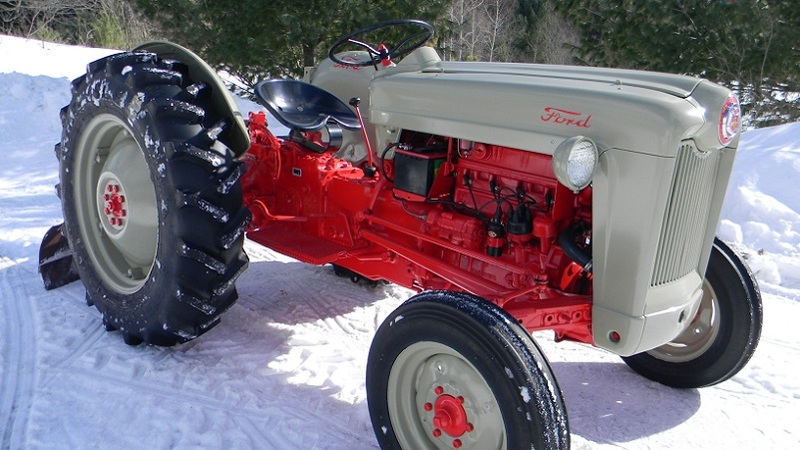 The Ford 9N Tractor went from handhake to production in just a few months. The very aggressive schedule resulted in some differences between the first models and later models. A cast aluminum hood was used because the stamped steel hood could not be manufactured in time. Other items included parts borrowed from Ford cars and trucks. Few 2N tractors found today will look any different from the 9N tractors. The stripped-down steel-wheel version was produced in very small quantities for just a few months before Ford was allowed to return to the pre-war specifications for tractors. A steel-wheel version photo is provided further down this page. Some of the obvious factory changes to the 2N tractors included; changing several previously chromed items to painted and changing from I-Beam to Tube-type Radius rods part way thru the 1944 production year. Few changes were made from 1945 to 1947. Ford engineers were busy working on the new 8N tractor design. 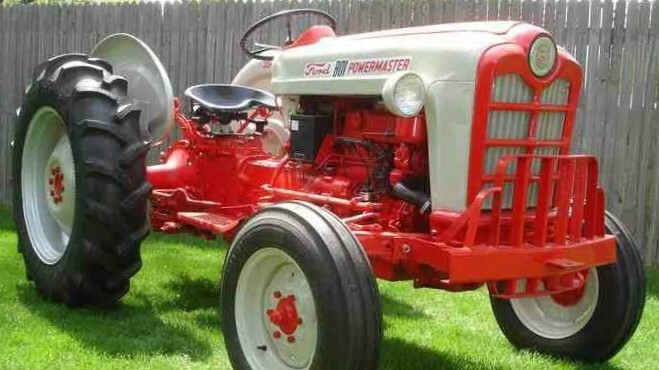 With the introduction of the new 8N tractor Henry Ford II terminated the handshake agreement with Ferguson and Ford Motor Company would no longer build tractors for Ferguson to sell. 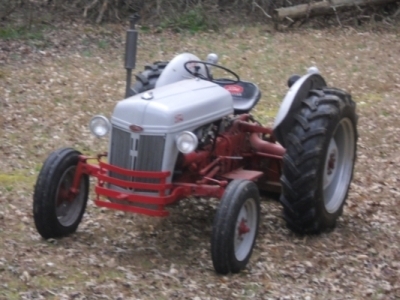 The 8N tractor still incorporated elements of the 3-point system that were patented by Ferguson. Accounts vary but Ferguson sued Ford Motor Company for 250 to 350 million. The lawsuit was eventually settled for 9.25 million. The settlement agreement in 1952 required additional design changes. We normally refer to cars and trucks by year of manufacture, and model designation. With the newest cars and trucks it is often necessary to use the VIN umber to make sure we get the correct parts. This habit is commonly used with farm tractors, but there is usually no need to be that precise. Industrial machinery is intended to last much longer and new models are not introduced nearly as often. This has changed some with the most modern equipment, but when these tractors were built, design changes were phased into production as problems were discovered or parts were redesigned for other reasons. Problems were most often identified by higher than acceptable returns for repairs. The original design may not have been completely defective, just not as good as it should be to survive real world abuse. Redesigned parts were most often phased into production after all the older parts had been used. New parts were generally designed to be compatible with tractors already in-use so older tractors could be easily upgraded if repairs were necessary. For this reason, buying correct parts for these tractors is not difficult, since there were basically only two models built from 1939 to 1952. It is so easy to upgrade and swap parts between tractors, few of the tractors still in use will be exactly as they were originally built. At the time these tractors were designed, Ford Motor Company was using single letter designations for each new development project. Successful projects that made it to production such as the Model "A" and Model "T" are very well known. Many projects never made it to production. The letter "N" was chosen for the project to design an affordable tractor using the Harry Ferguson hydraulic plow system. The designation "9N" stands for 1939 Model Tractor. 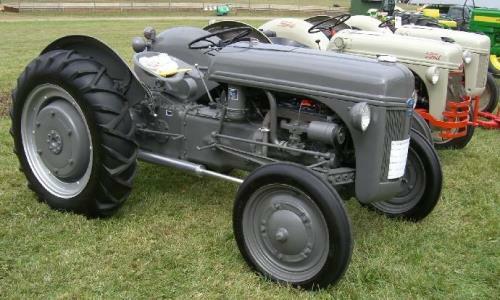 The 9N tractors were produced from 1939 to 1942. Ford Motor Company changed the model designation only when it was felt a new model was needed. 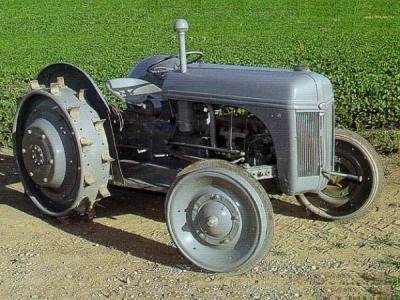 The Model 2N was a special case, created as a way to manufacture tractors when rubber tires, starters, and batteries were only available for vehicles directly related to fighting World War II. It is unclear why Ford didn't change the serial number prefix to 2N. Perhaps because the model designation was suggested by the Ferguson-Sherman Corporation rather than being a Ford factory model change. The new model may also have been a way to get around the Wartime price freeze. All N-Series Tractor Serial Numbers were hand-stamped on the engine block, up high, on the left side above the starter. Look for a flat spot in the casting a few inches back from the oil filter, just below the cylinder head. The serial numbers are usually difficult to read and they used some odd characters so a "6" will look like a lowercase "b", a "1" looks like a capital "I". All 9N serial numbers will have a small star symbol ☆ stamped at the beginning and the end. Most 8N serial numbers will also have these star symbols. After serial number ☆ 8N433578 ☆ the stars were changed to diamonds (like this ♢ 8N433579 ♢ ) to designate the change to cast sleeves in the cylinders. Do not depend on the stars or diamonds when buying parts to rebuild an engine. Many engines with the stars have been rebuilt using cast sleeves. Instead of the basic "9N" and "8N" model prefix, you may find some serial numbers like "9NAN", "BNO", or "9NBN". The "NAN" designation was for a kerosene burning tractor. Mostly sold in Europe, they are very rare in the USA. A "BNO 40" or "BNO 25" serial number prefix indicates a Moto Tug. These were stubby tractors with smaller tires and special sheet metal body parts, mostly used at airports. The "9NBN" serial number prefix is for a military tractor. There are other unique numbers and blocks with no serial numbers that can appear on these tractors. Ford sold engines for a lot of equipment and machinery made by other companies. Many tractors may have had engines replaced with engines that were originally installed in a completely different vehicle, stationary pump, or generator. Since the serial numbers are consecutive, if we know how many tractors were built each year it should be easy to determine the year any of these tractors was built. Unfortunately, it isn't that easy. Researching Ford tractor serial numbers is very frustrating. The confusion starts with the very first year the 9N was built. Official Ford documents, parts catalogs, and expert sources do not agree how many tractors were built in 1939. Mr. Harold Brock (1914-2011), the lead engineer in charge of the 9N tractor project, provided monthly production totals for 1939 that add up to 10310 tractors. Official Ford documents show 10233 or 10275 tractors built in 1939. Production totals for other years also vary between different documents. Another problem area is the when 2N model tractors started. Some documents show 2N production beginning in 1942, others show 1943, some documents appear to show 9N and 2N tractors being produced at the same time in 42-43. The information for 8N tractors is more consistent, but still has differences. Many parts are interchangeable between any 1939 to 1952 tractor. Some parts groups have to be swapped together, such as the front axle assembly. Any tractor that has been in service for over 50 years has had plenty of opportunities for parts to be swapped around. 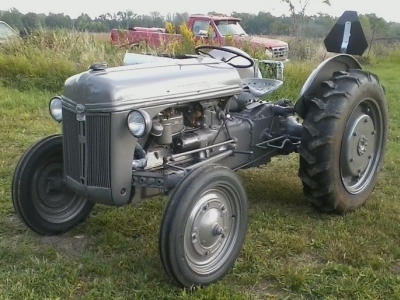 My first 8N tractor turned out to have a 1940-9N engine block. The transmission and axle castings were from 1948 and 1949. My 2N tractor had late 8N rear fenders. A song by Johnny Cash comes to mind, but wasn't that a Cadillac? Maybe he had a Ford tractor too. 23.6 H.P., 119.7 cubic inch displacement, 4 cylinder "flathead" engine with 3-speed manual transmission, separate right side and left side brake pedals, 6V positive ground electrical system, generator, Ferguson hydraulic implement attachment and control system, Power takeoff, and 5-lug 19” front wheels. The 2N was originally conceived as a stripped-down, steel-wheel version of the 9N so tractors could continue to be manufactured without using rubber tires, starters, and batteries that were in very short supply and needed for wartime production. Other than the few stripped-down versions specifications for the 2N tractors were the same as previous 9N tractors. Look close, there is a tiny "2N" added just below the Ford script on the badge. Model "2N" stands for 1942 Model Tractor. All United States manufacturing that was not directly related to producing supplies and equipment to fight World War II was halted by order of the US War Board on February 10, 1942. 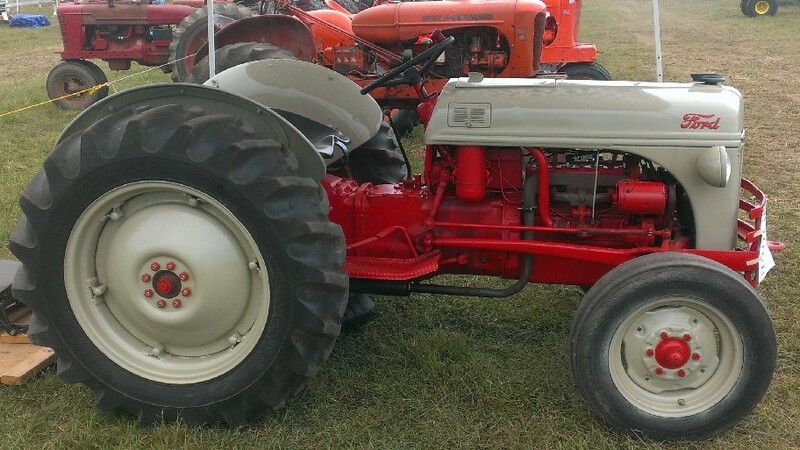 Sometime after that, Mr. Roger Kyes (president of the Ferguson-Sherman Corporation) came up with the idea of producing a tractor without rubber tires, battery, or starter. 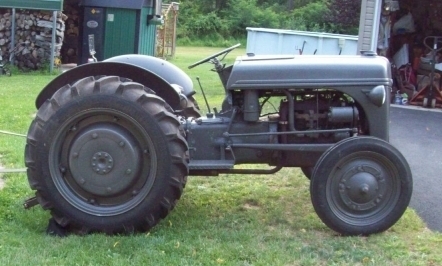 The Model 2N was born but production of the stripped-down tractors did not start until October 1942. 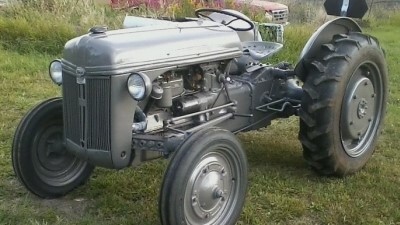 It is unknown how many of the stripped-down model 2N tractors were actually built between October 1942 and April 1943. Some evidence suggests that some 9N tractors were still being manufactured during this period. Many of the stripped-down 2N tractors were upgraded with rubber tires, batteries, generators, and starters as soon as those parts became available. A few collectors have restored early 2N tractors to the wartime specifications. Harry Ferguson traveled to Washington in January 1943 to talk to President Roosevelt about lifting the war restrictions on Ford Tractors. His argument was that the US farm industry was crucial to the war effort. The tractor could be operated by people too old or young to join the armed services. Ferguson had a 9N tractor and some implements to demonstrate. President Roosevelt was so impressed, he bought the tractor and implements on the spot for his farm in upstate New York, and allowed restrictions on tractor manufacturing to be lifted. From that point all model 2N tractors could be built like the earlier 9N tractors. There were still a few differences. Chrome parts were changed to painted and some factory improvements continued to be introduced. Fewer changes were made from 1945 to 1947 because Ford engineers were working on the new 8N tractor design. Please remember, there are differences in the official Ford documents we can find. If your tractor description and serial number does not appear to match with these listings I would greatly appreciate receiving photos. A new-to-you tractor may not prove anything since it has always been so easy to swap parts. 27.3 H.P., 119.7 cubic inch displacement, 4 cylinder "flathead" engine with 4-speed manual transmission, Factory footboards, Right and Left brake pedals co-located on the right side, 6V positive ground electrical system, generator, hydraulic implement attachment and control system, Power takeoff, and 6-lug 19” or 16”front wheels. This is the same engine as the 9N and 2N tractors with just a slight bump in compression ratio. I couldn't resist. This is of course not an original 8N, it is my 1952. The vertical exhaust is an aftermarket "improvement". The original exhaust was under the right floorboard (same location as the 9N/2N. Many people don't consider the vertical exhaust to be an improvement. The new 8N was a major redesign that went much further than the new "red belly" paint scheme. The front-distributor, 4 cylinder "flathead" engine got a slight increase in compression, and the transmission was now a 4-speed. Modifications to the hydraulic implement control system added a new position control lever under the seat. These changes may have been an attempt to avoid violating the Ferguson patents and the "Ferguson System" emblem was no longer displayed on the grill. Full-length running boards were added and both brake pedals were moved to the right side. Rear wheels were redesigned with smaller hubs and the front wheels were changed to 6-lug, 19” or 16”. As in the past, improvements continued to show up on the 8N tractors, without regard to a particular model year. The steering gear was redesigned sometime in 1949, the new side distributor engine appeared in mid-1950, and headlight "wing" mounts changed to the round type. By the time production ended in 1952, a proof-meter had been added to the dash, the upper lift arms were improved, and the transmission housing got a "bump" in the side to provide space for a future slower (larger) reverse grear. To my knowledge, the slower reverse gear was never installed in any 8N tractor. There are individuals who claim to have 8N tractors with higher serial numbers. Would you believe ♢ 8N567420 ♢? I'm a bit skeptical of one that high. So far, serial number ♢ 8N524076 ♢ is the highest 8N number that currently seems to be verifiable. If anyone has documentation of a higher number, with photo or some other way to document it, please send it to me. 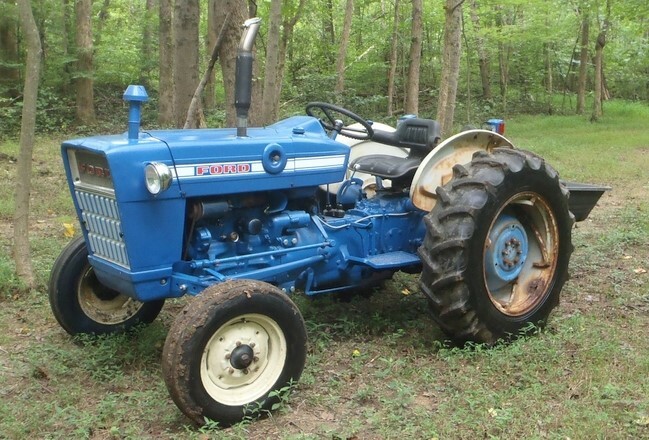 It has been well over 50 years since production of the 8N tractor ended. Many parts are interchangable. Older tractors may have been upgraded with newer parts or old parts may have replaced broken parts. Many tractors have had engines and other parts replaced. It can be difficult to determine if a tractor is all original. Many dealers took tractors in trade and reconditioned them to "like new" condition. This process often included a complete strip and painting them the latest color scheme. Layers of paint and dirt can easily conceal mismatched parts. There is nothing wrong with mis-matched parts if you are looking for a working tractor. Other identifying marks are casting codes, which usually include a date, or date code. The trick to reading those seems to vary from one part to another. Some codes are four digits like D128. The letter indicates month with "A" being the first month "January", so "D" in this example would be "April". The next two letters are the day of the month, and the final letter indicates the year. 30.15 H.P., 134 cubic inch displacement, 4 cylinder overhead valve engine with 4-speed manual transmission, Factory footboards, Right and Left brake pedals co-located on the right side, 6V positive ground electrical system, generator, hydraulic implement attachment and control system, live hydraulics available, Power takeoff, and 6-lug 16”front wheels. 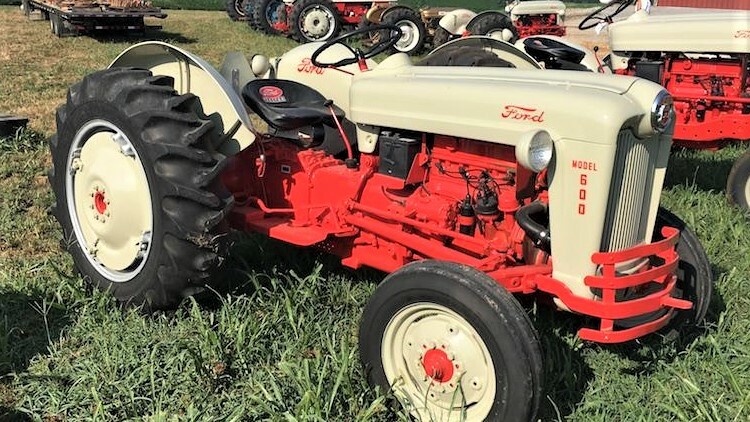 The 8N tractor model run was shortened by some of the rulings from the Ferguson lawsuit settlement and the fact that Harry Ferguson had been selling slightly more powerful TE-20, TEA-20, and TO-20 tractors based largely on 9N tractor plans obtained from Ford. The NAA tractors began coming off the assembly line late in 1952, marking the end of the 8N tractor model run. The all new Ford NAA was just slightly larger and about 100 pounds heavier than the 8N, with a new overhead valve engine, live hydraulic system, and other design changes intended to avoid any future problems with various Furguson patents. 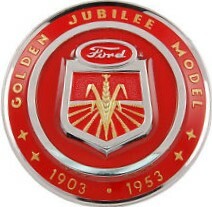 The NAA was introduced as a Golden Jubilee edition with new sheet metal and a special hood badge to celebrate the Ford Motor Company 50th anniversary. Early NAA tractor serial numbers before NAA22239 were stamped on the left side of the engine. Beginning with NAA22239 the serial numbers were stamped on the left side of the transmission housing. Ford tractors increased in size and horsepower with more different model types and options introduced each year. Starting with the Hundred series, Ford began using the model number prefix to indicate some options such as engine size and transmission type. Refer to the following tables to decipher model numbers for hundred and 01 series tractors. The '54-'57 Hundred Series tractors have a three digit model number ending with a zero. The model number indicates specific options such as engine size and transmission. The '57-'62 01 Series tractors continued with similar three digit model numbers ending with a number 1 and a new suffix. The breakdown for '62-'64 Thousand series tractors is coming soon! VALUE - "What's My Tractor Worth?" The value of vintage tractors is generally in direct proportion to their rarity. N-Tractors may never be considered "rare". The average, non-running, field ornament, can often be hauled away free-of-charge. I wouldn't offer more than $500 for a complete non-running tractor. Good rear tires are worth at least $400, since new ones will cost at least $1000 by the time you have them mounted. Prices for running N-Tractors, usually start around $1000. DO NOT be fooled by a new paint job! New paint costs around $50, but adds $1000 to the average asking price. 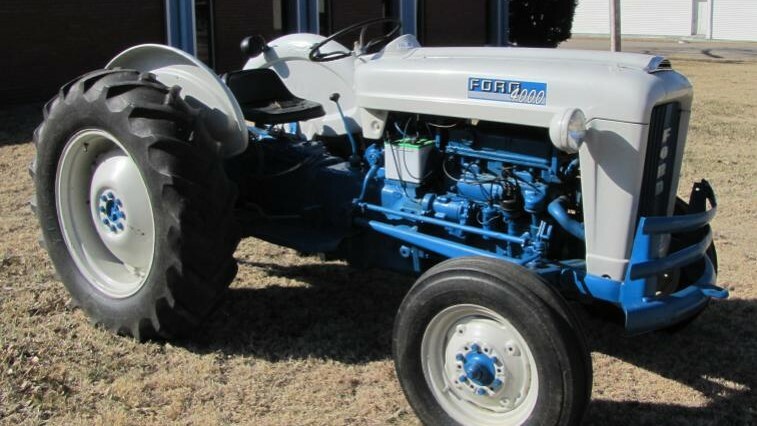 In Central Virginia a good running, N-Tractor, with straight sheet metal, good tires, and no major mechanical issues should be worth as much as $2500. I generally start my value estimate at $2000 and deduct for any obvious work that it needs as I walk around it. In most cases my value estimate will go negative. Prices are not likely to improve. There are too many small diesel tractors available used starting at around $3000. Anyone looking for a working tractor should be looking for a small diesel. Paying for maintenance on a vintage gas engine makes any diesel a better value for a working tractor. Low serial number tractors for each model are worth more to collectors. The earliest 9N's had cast aluminum hoods that are very rare and collectable today. An early, original 1939-9N might be the holy grail of collectable N-Series tractors. An early 2N on steel wheels with magneto ignition is another collectable. Funk 6 cylinder engine conversions, and others, such as the Flathead V8, are in a completely different price bracket. A conversion, in poor (non-running) condition might start at around $5000. If you are just looking for a working tractor, the higher serial numbers for each model will have the most factory upgrades. Overall Condition has more bearing on value than anything else, unless you are a collector. Even a complete basket case is not beyond redemption if you can get it cheap. Most parts are still readily available. These well designed, extremely durable machines continue to do real work while other tractors of the same era were scrapped long ago. Unfortunately, only an enthusiast can afford to keep a vintage gas engine in good tune so it stays reliable. A good method for determining the value of anything is to search for similar items on ebay and Amazon. Ignore current auction prices. Look at recently sold prices and compare descriptions to discover what adds significant value to a specific item. It only takes a few minutes to determine a general range of value for just about anything. HOW MANY N-TRACTORS ARE THERE? The Ford N-Series tractors were very successful. Nearly a million N-Tractors were produced from 1939 to 1954, and about half of them may still be lurking in barns and fields. Some N-Tractors were shipped overseas, but to put the number in perspective, there may still be as many as 20 actual running N-Tractors per county in the USA, plus another 40 or 50 per county lurking in barns and fields, waiting to be restored.